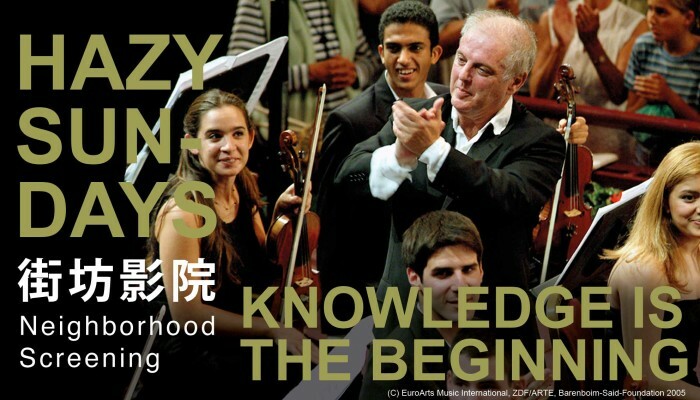 This month, ‘Hazy Sundays’ brings you a screening of Emmy Award-winning documentary – Knowledge is the Beginning by Paul Smaczny. This documentary tells the story of the West-Eastern Divan Orchestra, an orchestra made up of young musicians coming from Egyptian, Iranian, Israeli, Jordanian, Lebanese, Palestinian, Syrian and Spanish backgrounds who are brought together each summer. Founded in 1990 by Daniel Barenboim and the late Edward Said, the orchestra is an attempt to bring different points of view together through music making. The film chronicles five summer workshops in Weimar and Seville, as well as the concert performed in Ramallah in August, 2005. Chosen by Samson Young, Dr Giorgio Biancorosso and Qinyi Lim, this month’s screening is part of the exhibition public programme of Orchestrations.